HomeStoriesBlogThe Team Scotland 2014 Commonwealth Games Kit- PR Gold? The Team Scotland 2014 Commonwealth Games Kit- PR Gold? When Team Scotland’s Commonwealth Games Opening Ceremony kit was revealed in Stirling on July 6th, our PR team at Holyrood PR exploded into uproar – as did the rest of Scotland. With a plethora of jokes and reaction buzzing around the subject, we wanted to take a step back to assess the controversial outfits for their worth in the PR world. 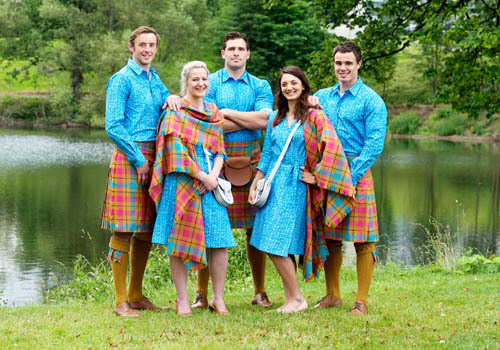 The clashing caramel, fuchsia and turquoise colour palate, and the tartan dress designed by textile artist Jilli Blackwood, has been branded an embarrassment to Scotland and its athletes. The public’s reaction sparked a petition on change.org to overthrow the team’s choice which in its first two weeks was signed by 4,300 people. However, could the age old adage that any publicity is good publicity apply here? Could the public’s reaction actually be beneficial for the Scotland team and for designer Jilli Blackwood? The revelation of the Opening Ceremony outfit, which in prior years has been a fairly insignificant announcement, spurned a huge reaction from Scotland and beyond, becoming a hot topic especially on social media. While the first tweet reacting to the debut picture, from hockey player Vikki Bunce, was positive, it wasn’t long before voices of dissent piped up. Protesters took to twitter to voice their opinion, hailing the kit ‘vile’ and ‘the reason Sir Chris Hoy retired’, and even comparing its reception to that of Gazza’s Euro ‘96 goal. Twitter users have also gone so far as to link the costume to the current debate surrounding Scottish Independence, stating concern if the unusual colour palate is a reflection of Scottish decision making skills. But by linking the issue with one that is on every Scot’s lips, these commentators could have unknowingly done the Scotland Commonwealth team a favour in PR terms. Bold, unapologetic and unique, just like the Scottish culture it represents, the Commonwealth Games Opening Ceremony outfit smacks of being a savvy PR move. It is safe to say, the multiple news articles and comment have ensured the Commonwealth Games and the Scotland team itself have gained a hefty amount of coverage that they would have missed out on had they chosen a safer design. The coverage and reaction even reached as far afield as Australia, with Melbourne’s Herald Sun soothing its readers’ dismay at their own national outfit with the consoling message, ‘At least we’re not Scottish’. The Guardian labelled it as the ‘kit for the Instagram WTF generation’, and we have to agree the kit caters to today’s hunger for absurdity. Sure enough, iconic Scottish brand Irn Bru have embraced the kit and served themselves a slice of the attention, with advertising billboards stating, ‘We will dress like numpties’. Similarly, designer Jilli Blackwood has made a name as an outlandish avant-garde artist, which is sure to bring her more wacky work in the future. Any outlandish move is sure to split public opinion, and the Commonwealth kit is no exception. But with the world’s eye firmly focussed on Scotland, the question to pose is this one: Is this total bad taste and poor judgement or brilliant publicity? What do you think?